The most toxic items in most homes are household cleaners. Ironically, we use these products to make our homes cleaner, germ-free, and therefore healthier; however, they are doing the exact opposite by creating a toxic environment. This is also true in the work place and schools. Thankfully, there are alternative, non-toxic, natural solutions. Unfortunately, many natural cleaners are quite expensive. If you make your own, this cost is greatly reduced. One unique natural solution we have discovered comes from GenEon Technologies: An Engineered Water Technology Company. We were sent the Trio package to try. When I first opened the package, I admit to being a little overwhelmed. Two decanters, three little bottles, a heating pad….what was I to do? Instead of mixing harmful, concentrated chemicals with water, you simply mix safe, natural minerals with regular tap water. GenEon’s technology does the rest. Really, not that hard, but I don’t like the idea of using energy to make my cleaning products. It kind of contradicts the eco-friendly claims, but I live off-the-grid, so I can use the power guilt-free. Energizing the minerals is an important part of the process that makes these cleaners effective and allows for natural ingredients. Mixing water and minerals, and then energizing them with an electrical charge creates safe, effective cleaners, degreasers and sanitziers, comprised of hypochlorite as a cleaner and hypchlorous as a sanitizer. Based on Michael Faraday’s proven science of electrolysis, GenEon allows users to create a mixture of proprietary minerals and water with an electrical charge to produced Electrolyzed Water: safe, effective, wallet-friendly and sustainable cleaners, degreasers and sanitizers. In fact, the GenEon solution is so safe and natural, the human body produces a form of the solution in white blood cells to kill germs and fight infections. 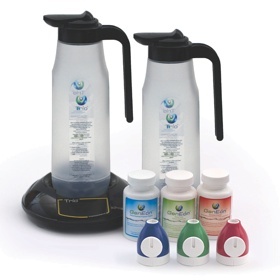 GenEon promises to save you 400% compared to buying toxic, chemical cleaners! Plus it kills 99.999% germs!